The Talmud itself gives no information concerning the origin of the middot, although the Geonim regarded them as Sinaitic ( ; comp. R. Samson of Chinon in his "Sefer ha-Keritot"). This can be correct only if the expression means nothing more than "very old," as is the case in many Talmudic passages. It is decidedly erroneous, however, to take this expression literally and to consider the middot as traditional from the time of Moses on Sinai. The middot seem to have been first laid down as abstract rules by the teachers of Hillel, though they were not immediately recognized by all as valid and binding. Different schools interpreted and modified them, restricted or expanded them, in various ways. Akiba and Ishmael and their scholars especially contributed to the development or establishment of these rules. Akiba devoted his attention particularly to the grammatical and exegetical rules, while Ishmael developed the logical. The rules laid down by one school were frequently rejected by another because the principles which guided them in their respective formulations were essentially different. According to Akiba, the divine language of the Torah is distinguished from the speech of men by the fact that in the former no word or sound is superfluous. He established two principles broadening the scope of the rule of his teacher Nahum of Gimzo, who had declared that certain particles, like , and , were inclusive and certain others, such as , and , were exclusive. These two principles are: (1) (= "one inclusion added to another is equivalent to an exclusion"; Sifra, Ẓaw, Pereḳ, 11 [ed. Weiss, p. 34d]); and (2) (= "words are amplifications"; Yer. Shab. xix. 17a). Hence he interprets the following forms of expression as amplifications: an infinitive before a finite verb, e.g., (Sanh. 64b); the doubling of a word, e.g., (Yeb. 71a); and the repetition of a term by a synonym, e.g., (Yer. Soṭah viii. 22b). Ishmael, on the contrary, lays down the principle, (= "the Torah speaks in the language of men"; Sifre, Num. 112). The Bible may, therefore, have employed superfluous words and sounds; and forced values should not be assigned to them for the purpose of deducing new rules therefrom. The same statement holds with regard to the repetition of an entire section. Ishmael is of the opinion that "the Torah at times repeats a whole section of the Law in order to give a new application to it" ( ; Sifre, Num. 2, according to the reading of Elijah Wilna). It is not necessary, therefore, to draw a new inference from every repetition. Thus, for instance, in Num. v. 5-8 the Torah repeats the section on in Lev. v. 20-26 (vi. 1-7, A. V.) for the purpose of teaching the new ruling that in certain cases recompense for sin shall be made directly to the priests. Akiba asserts, on the other hand (in Sifre, l.c., according to the reading of Elijah Wilna), that "Everything that is said in a section so repeated must be interpreted" (= ), and that new deductions may be drawn from it. According to this view, in Num. v. 5-8, for example, a new meaning must be sought in the repetition of the Law. According to Akiba, the traditional vocalization in the Bible of a word which may be read in various ways is well founded ( ); and he deduces many rules from the meanings which such words have according to traditional pointing. 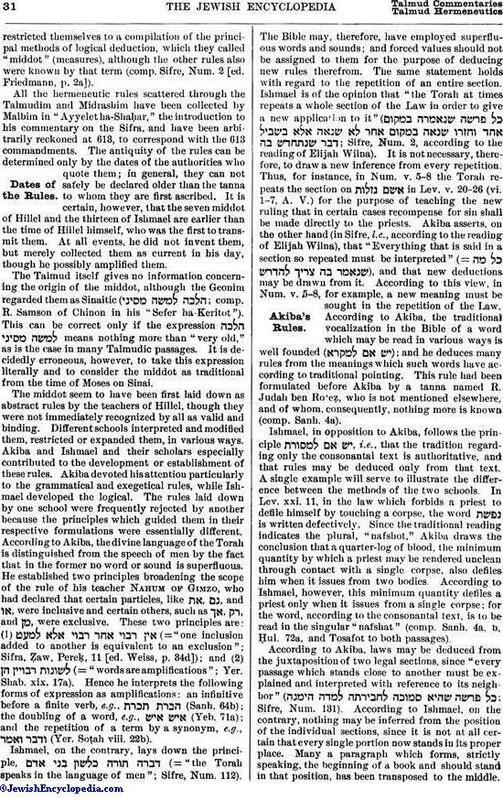 This rule had been formulated before Akiba by a tanna named R. Judah ben Ro'eẓ, who is not mentioned elsewhere, and of whom, consequently, nothing more is known (comp. Sanh. 4a). Ishmael, in opposition to Akiba, follows the principle , i.e., that the tradition regarding only the consonantal text is authoritative, and that rules may be deduced only from that text. A single example will serve to illustrate the difference between the methods of the two schools. In Lev. xxi. 11, in the law which forbids a priest to defile himself by touching a corpse, the word is written defectively. Since the traditional reading indicates the plural, "nafshot," Akiba draws the conclusion that a quarter-log of blood, the minimum quantity by which a priest may be rendered unclean through contact with a single corpse, also defiles him when it issues from two bodies. According to Ishmael, however, this minimum quantity defiles a priest only when it issues from a single corpse; for the word, according to the consonantal text, is to be read in the singular "nafshat" (comp. Sanh. 4a, b, Ḥul. 72a, and Tosafot to both passages). According to Akiba, laws may be deduced from the juxtaposition of two legal sections, since "every passage which stands close to another must be explained and interpreted with reference to its neighbor" ( ; Sifre, Num. 131). According to Ishmael, on the contrary, nothing may be inferred from the position of the individual sections, since it is not at all certain that every single portion now stands in its proper place. 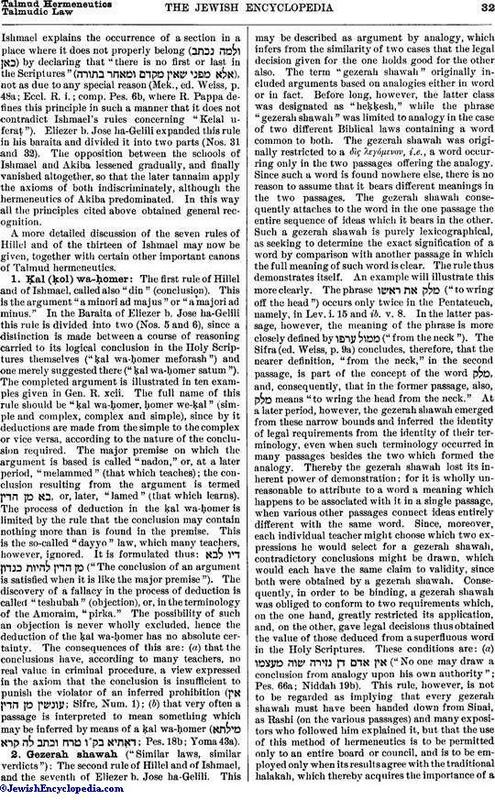 Many a paragraph which forms, strictly speaking, the beginning of a book and should stand in that position, has been transposed to the middle.Ishmael explains the occurrence of a section in a place where it does not properly belong ( ) by declaring that "there is no first or last in the Scriptures" ( ), not as due to any special reason (Mek., ed. Weiss, p. 48a; Eccl. R. i.; comp. Pes. 6b, where R. Pappa defines this principle in such a manner that it does not contradict Ishmael's rules concerning "Kelal uferaṭ"). Eliezer b. Jose ha-Gelili expanded this rule in his baraita and divided it into two parts (Nos. 31 and 32). The opposition between the schools of Ishmael and Akiba lessened gradually, and finally vanished altogether, so that the later tannaim apply the axioms of both indiscriminately, although the hermeneutics of Akiba predominated. In this way all the principles cited above obtained general recognition. The first rule of Hillel and of Ishmael, called also "din" (conclusion). This is the argument "a minori ad majus" or "a majori ad minus." In the Baraita of Eliezer b. Jose ha-Gelili this rule is divided into two (Nos. 5 and 6), since a distinction is made between a course of reasoning carried to its logical conclusion in the Holy Scriptures themselves ("ḳal wa-ḥomer meforash") and one merely suggested there ("ḳal wa-ḥomer satum"). The completed argument is illustrated in ten examples given in Gen. R. xcii. The full name of this rule should be "ḳal wa-ḥomer, ḥomer we-ḳal" (simple and complex, complex and simple), since by it deductions are made from the simple to the complex or vice versa, according to the nature of the conclusion required. The major premise on which the argument is based is called "nadon," or, at a later period, "melammed" (that which teaches); the conclusion resulting from the argument is termed , or, later, "lamed" (that which learns). The process of deduction in the ḳal wa-ḥomer is limited by the rule that the conclusion may contain nothing more than is found in the premise. This is the so-called "dayyo" law, which many teachers, however, ignored. It is formulated thus: ("The conclusion of an argument is satisfied when it is like the major premise"). The discovery of a fallacy in the process of deduction is called "teshubah" (objection), or, in the terminology of the Amoraim, "pirka." The possibility of such an objection is never wholly excluded, hence the deduction of the ḳal wa-ḥomer has no absolute certainty. The consequences of this are: (a) that the conclusions have, according to many teachers, no real value in criminal procedure, a view expressed in the axiom that the conclusion is insufficient to punish the violator of an inferred prohibition ( ; Sifre, Num. 1); (b) that very often a passage is interpreted to mean something which may be inferred by means of a ḳal wa-ḥomer ( ; Pes. 18b; Yoma 43a). The second rule of Hillel and of Ishmael, and the seventh of Eliezer b. Jose ha-Gelili. This may be described as argument by analogy, which infers from the similarity of two cases that the legal decision given for the one holds good for the other also. 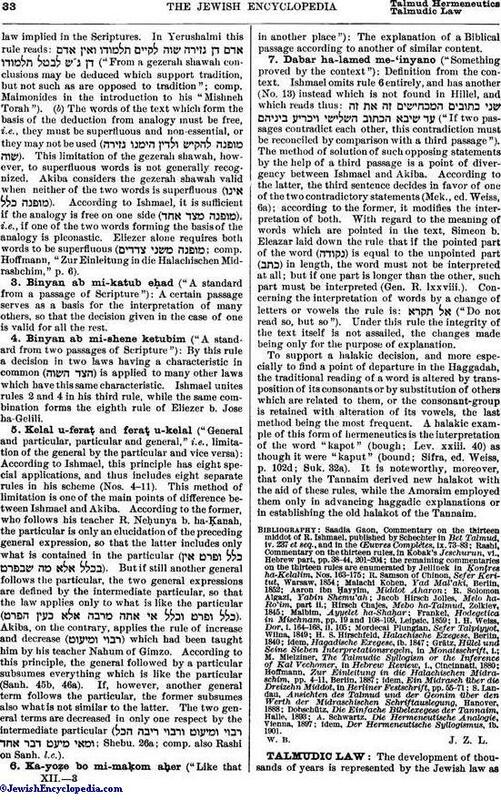 The term "gezerah shawah" originally included arguments based on analogies either in word or in fact. 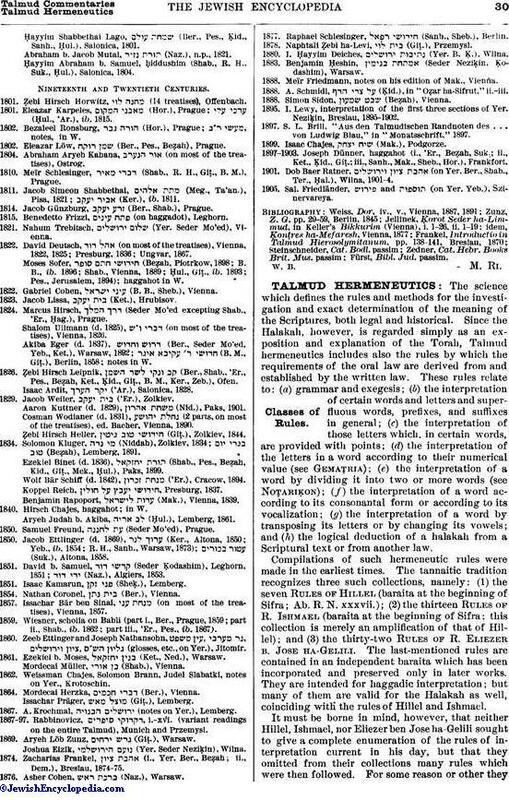 Before long, however, the latter class was designated as "heḳḳesh," while the phrase "gezerah shawah" was limited to analogy in the case of two different Biblical laws containing a word common to both. The gezerah shawah was originally restricted to a δὶς λερόμευον, i.e., a word occurring only in the two passages offering the analogy. Since such a word is found nowhere else, there is no reason to assume that it bears different meanings in the two passages. The gezerah shawah consequently attaches to the word in the one passage the entire sequence of ideas which it bears in the other. Such a gezerah shawah is purely lexicographical, as seeking to determine the exact signification of a word by comparison with another passage in which the full meaning of such word is clear. The rule thus demonstrates itself. An example will illustrate this more clearly. The phrase ("to wring off the head") occurs only twice in the Pentateuch, namely, in Lev. i. 15 and ib. v. 8. In the latter passage, however, the meaning of the phrase is more closely defined by ("from the neck"). The Sifra (ed. Weiss, p. 9a) concludes, therefore, that the nearer definition, "from the neck," in the second passage, is part of the concept of the word , and, consequently, that in the former passage, also, means "to wring the head from the neck." At a later period, however, the gezerah shawah emerged from these narrow bounds and inferred the identity of legal requirements from the identity of their terminology, even when such terminology occurred in many passages besides the two which formed the analogy. Thereby the gezerah shawah lost its inherent power of demonstration; for it is wholly unreasonable to attribute to a word a meaning which happens to be associated with it in a single passage, when various other passages connect ideas entirely different with the same word. Since, moreover, each individual teacher might choose which two expressions he would select for a gezerah shawah, contradictory conclusions might be drawn, which would each have the same claim to validity, since both were obtained by a gezerah shawah. Consequently, in order to be binding, a gezerah shawah was obliged to conform to two requirements which, on the one hand, greatly restricted its application, and, on the other, gave legal decisions thus obtained the value of those deduced from a superfluous word in the Holy Scriptures. These conditions are: (a) ("No one may draw a conclusion from analogy upon his own authority"; Pes. 66a; Niddah 19b). This rule, however, is not to be regarded as implying that every gezerah shawah must have been handed down from Sinai, as Rashi (on the various passages) and many expositors who followed him explained it, but that the use of this method of hermeneutics is to be permitted only to an entire board or council, and is to be employed only when its results agree with the traditional halakah, which thereby acquires the importance of alaw implied in the Scriptures. In Yerushalmi this rule reads: ("From a gezerah shawah conclusions may be deduced which support tradition, but not such as are opposed to tradition"; comp. Maimonides in the introduction to his "Mishneh Torah"). (b) The words of the text which form the basis of the deduction from analogy must be free, i.e., they must be superfluous and non-essential, or they may not be used ( ). This limitation of the gezerah shawah, however, to superfluous words is not generally recognized. Akiba considers the gezerah shawah valid when neither of the two words is superfluous ( ). According to Ishmael, it is sufficient if the analogy is free on one side ( ), i.e., if one of the two words forming the basis of the analogy is pleonastic. Eliezer alone requires both words to be superfluous ( ; comp. Hoffmann, "Zur Einleitung in die Halachischen Midrashchim," p. 6). By this rule a decision in two laws having a characteristic in common ( ) is applied to many other laws which have this same characteristic. Ishmael unites rules 2 and 4 in his third rule, while the same combination forms the eighth rule of Eliezer b. Jose ha-Gelili. According to Ishmael, this principle has eight special applications, and thus includes eight separate rules in his scheme (Nos. 4-11). This method of limitation is one of the main points of difference between Ishmael and Akiba. According to the former, who follows his teacher R. Neḥunya b. ha-Ḳanah, the particular is only an elucidation of the preceding general expression, so that the latter includes only what is contained in the particular ( ). But if still another general follows the particular, the two general expressions are defined by the intermediate particular, so that the law applies only to what is like the particular ( ). Akiba, on the contrary, applies the rule of increase and decrease ( ) which had been taught him by his teacher Nahum of Gimzo. According to this principle, the general followed by a particular subsumes everything which is like the particular (Sanh. 45b, 46a). If, however, another general term follows the particular, the former subsumes also what is not similar to the latter. The two general terms are decreased in only one respect by the intermediate particular ( ; Shebu. 26a; comp. also Rashi on Sanh. l.c.). Definition from the context. Ishmael omits rule 6 entirely, and has another (No. 13) instead which is not found in Hillel, and which reads thus: ("If two passages contradict each other, this contradiction must be reconciled by comparison with a third passage"). The method of solution of such opposing statements by the help of a third passage is a point of divergency between Ishmael and Akiba. According to the latter, the third sentence decides in favor of one of the two contradictory statements (Mek., ed. Weiss, 6a); according to the former, it modifies the interpretation of both. With regard to the meaning of words which are pointed in the text, Simeon b. Eleazar laid down the rule that if the pointed part of the word ( ) is equal to the unpointed part ( ) in length, the word must not be interpreted at all; but if one part is longer than the other, such part must be interpreted (Gen. R. lxxviii.). Concerning the interpretation of words by a change of letters or vowels the rule is: ("Do not read so, but so"). Under this rule the integrity of the text itself is not assailed, the changes made being only for the purpose of explanation.